This document explains the Cable Association (cba) between a MS Windows host and a IOGear HUB  using the WiMedia application . The logs analyzed here have been generated by a usb sniffer, usbsnoop . This analysis was made to clarify the cable association specification. It’s the result of one day's work by me and my friend Alex. Our first usb_message_control is a request of information association . 01 00 Certified Wireless USB should have value: 0×1 in this field. 00 00 00 00 == RetriveHostInfo, in this case the host should send its CHID value to the device, should happend before the AssociateWUSB, as happend here. 00 00 00 00 Represent the size of the association type, zero in this case. 6c 00 00 00 Association type info size, in this case 108 bytes. In this block we have a GET_ASSICIATION_INFORMATION  request with an ASSOCIATION_INFORMATION  anwser. 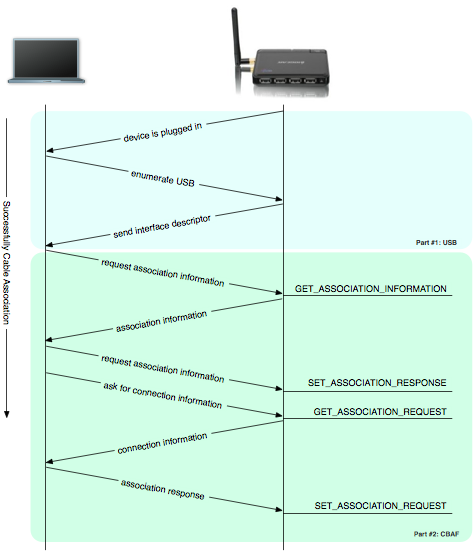 This ASSOCIATION_INFORMATION are composed by two ASSOCIATION_REQUEST , one is a RetriveHostInfo request and the another one is AssociateWUSB . As a response of our first usb_message_control request, bellow is the host info. 00 00 02 00 01 00 Association type id as expected, this values are filled with the values of the last request. Attribute id: 0x0, Attribute length: 0x2 and data 0x1. 01 00 02 00 00 00 Association sub type id. 13 c7 31 42 52 44 30 30 32 30 30 30 c4 9a d5 70 CHID¹. 08 00 02 00 10 33 Lang ID, Unicode language id code used in the next field. This is block is structured as a HOST_INFO . Its request is SET_ASSOCIATION_RESPONSE. 08 00 02 00 09 04 Language ID, used by the next field. 0b 00 40 00 Device friendly name, in unicode format. This block contains the information about the device, it exchange information about the device id, supported band groups and device friendly name . The same request as above but now the response is complete with the device friendly name. 04 10 02 00 01 00 Group band. See section 7.4.1 of WUSB specification.